The perfect tool to round out beauty routines. Premium quality, pure cotton for ultra absorbency with an added layer of spun-lace for strength and quilted to resist shredding. Use the quilted side for application of toners, astringents, and lotions and the softer side for removal of nail polish, foundation, blush, eye make-up, and lipstick. Hypoallergenic and soft enough to use on delicate areas of the face, including around the eyes. 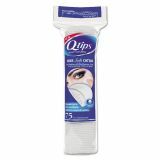 Q-tips Beauty Rounds, 75/Pack, 24 Packs/Carton - Premium quality, pure cotton for ultra absorbency with an added layer of spun-lace for strength and quilted to resist shredding. Use the quilted side for application of toners, astringents, and lotions and the softer side for removal of nail polish, foundation, blush, eye make-up, and lipstick. Hypoallergenic and soft enough to use on delicate areas of the face, including around the eyes.